As well as being the sole UK partner for two of the world’s leading producers of KVM and USB extenders, we also have our own manufacturing facility – Printed Systems Ltd (PSL) – just north of London in the leafy county of Hertfordshire. 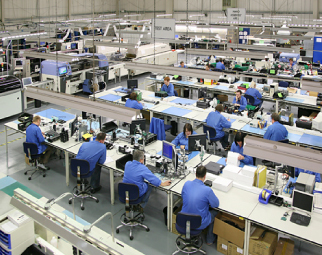 British manufacturing is the world’s finest and our OEM clients know that when they make an order, they get a swift turnaround, a flexible service and world-class production standards. PSL’s state-of-the-art manufacturing facility houses four surface-mount lines capable of placing the finest pitch components, automated optical inspection and advanced BGA inspection and rework stations. In addition, the business carries ISO 9001 accreditation as well as being fully compliant with RoHS (Restriction of Hazardous Substances Directive) policies, processes and procedures. PSL is now one of the top UK contract manufacturers for LED lighting, having invested heavily in specialised machinery capable of handling PCBs up to 1.6m long. All products are shipped direct from PSL to wherever in the world our clients are based and the business model is simple: design, manufacture and deliver technically-advanced products at competitive prices with outstanding pre-sales, during and after-sales care. It’s not rocket science but it’s worked for almost 20 years. Please contact us for more details on 020 8099 3089.